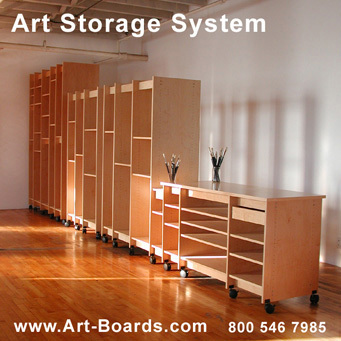 Archival Art Mounting of art by Art Boards™ Archival Art Supply in Brooklyn NY. Professional custom mounting of finished artwork. are archivally mounted on to panel by Art Boards™. Art is mounted with an archival conservators adhesive. Mounting is reversible; paintings, drawings, & prints can be removed for future art conservation. Art mounted on panel can hang without framing or glass. Custom framing of mounted art is also available from Art Boards™. Click photos below to see some examples of art mounted by Art Boards™. mounted to cradled art panel. Professional mounting of any size Artwork. Art Storage System Size and Price Overview. Made in Brooklyn, NY. In the USA.